Children can create great artwork with every dab or twist of these marvelous art tools. Each of the 4 tools has a unique pattern, so a child can experiment with many different effects and just let their imagination run wild. 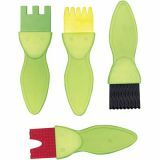 Each tool has a fun, plastic handle that holds one of the following four brush designs: 3 rows of concentric circles, a burst, 5 clusters of 5 dots, and 2 rows of concentric circles. These tools clean up easily with soap and warm water. 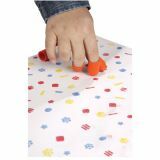 With 24 pieces per pack, 3 each of 8 designs, you can stamp your way across any size paper with many figures and patterns. Each stamp measures 1-3/8" high and has a 3/4" diameter. Here's a super set of four heavy duty rollers with 1-1/2" wide unique, inventive, and clever designs for use with paint or clay. Each 5" durable plastic, comfort-grip handle features a unique design molded in hard rubber on a sturdy roller. Rollers are easily cleaned allowing for child-safe, long term use. Set 1 contains 8 line wavy continuous pattern, small, medium, & large dots in random pattern, border pattern of lace-like squiggles, and 7 line dots, dashes & arcs in a continuous pattern. 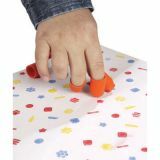 Here's a super set of four heavy duty rollers with 1-1/2" wide unique, inventive, and clever designs for use with paint or clay. Each 5" durable plastic, comfort-grip handle features a unique design molded in hard rubber on a sturdy roller. Rollers are easily cleaned allowing for child-safe, long term use. Set 2 rollers include stars, hoops, swirls, and diamonds. These four terrific paint effect stamp tools each have a different texture or design and can be used to create wonderful artwork. Each tool measures 4-7/8" x 1-1/2". 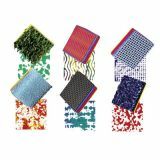 Beautiful patterns on these six paint effect stamps let you stamp your way to creative arts and crafts. 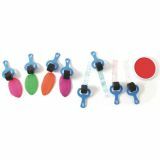 Each stamp measures 2-3/8" x 2-3/8" and has a plastic handle. 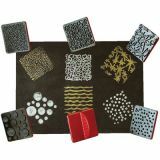 These six marvelous textured stampers all have different patterns and are great for doing backgrounds for artwork. Each stamp measures 2-3/8" x 2-3/8" and has a plastic handle.